E-learning training participants from Ukraine and trainers from eDGH. 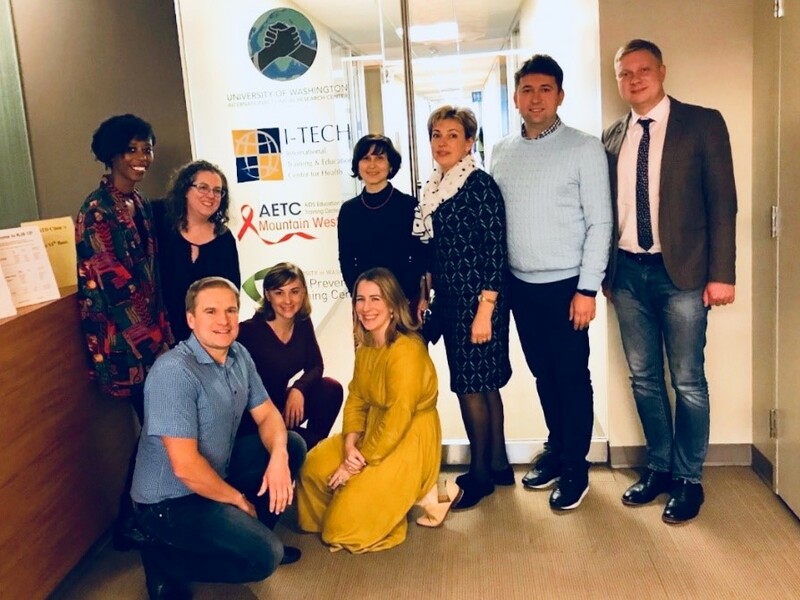 In late October, the University of Washington’s Department of Global Health E-Learning (eDGH) facilitated a five-day course on e-learning best practices for a six-member delegation from Ukraine. The goal of the training was to improve competencies in the development and implementation of online and blended teaching courses in health care. Throughout the five days, experts from eDGH covered the nuts and bolts of e-learning content design, development, rollout, management, assessment, and continuous improvement. The training participants, led by the International Training and Education Center for Health (I-TECH) Ukraine Program Director Iryna Yuryeva, and Training Developer Tetiana Bairachna, included delegates from the Public Health Center of the Ministry of Health of Ukraine (PHC), Ukrainian Family Medicine Training Center of Bogomolets National Medical University (UCFM), Nursing College of Ternopil State Medical University (TSMU), and Nursing College of Poltava Ukrainian Dental Academy (PUDA). The host organizations are either currently implementing online learning programs or planning to launch them in the near future: PHC recently introduced a series of distance learning products on HIV care and treatment and UCFM adapted the University of Washington’s Leadership and Management in Health course to the Ukrainian context. Thanks to the training, “we finally discovered formulas to calculate continuing medical education credits awarded for a distance course completion,” said Volodymyr Vysotskyi of UCFM. The Nursing College of TSMU offers online degrees such as a Bachelor and Master of Science in Nursing, and will benefit particularly from the course’s focus on evaluation. “Information on e-learning evaluation strategies was of special interest as we are planning to develop new online continuous medical education courses for nurses,” says Svitlana Yastremska of TSMU. The team of trainers – Alex McGee, eDGH Managing Director; Anya Nartker, eDGH Manager of Online Education; and Elizabeth Scott and Leslie Wall, eDGH Senior eLearning Developers – shared their expertise in planning, development, and implementation of e-learning courses. In addition, eDGH presented best practices and challenges and advised participants on technicalities of current e-learning courses under development in their organizations. “The approaches to sustainably institutionalize e-learning into the medical education system, both pre- and in-service programs, were the most important part of this training for me,” noted Mykhailo Riabinchuk of PHC. To ensure continuity of the training, I-TECH and eDGH plan to start a series of follow-up webinars to support training participants as they promote and scale up e-learning in health care in Ukraine. I-TECH Ukraine views developing local capacity in e-learning as a strategic component of programmatic efforts as it extends access and improves efficiency. “Leveraging the knowledge gained on distance learning, we will be able to take the postgraduate education at our institution to the next level of quality,” said Vadym Bodnar of PUDA.